This is for the serious home cook. Reason being- the proper execution of these requires kitchen skill. But for those adventurous enough I would be more than happy to teach you the technique. 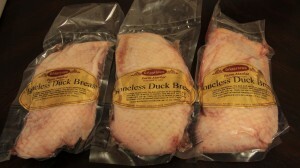 So I posted a couple of pics of an hours d’eouvre I did with this Duck Breast. I served it on Miso Spoons with Leek Puree and Wild Blueberry Preserves. Point is- this Duck can have many uses besides a main course?‍? ?